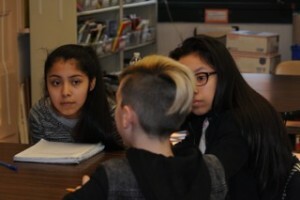 Last week I reported on the first week that I led a workshop for middle school writers at New Voices School as part of the VCFA Young Writers Network. That first workshop, on December 3, focused on getting a story moving again when it gets stuck in the middle, and I used an activity that Meg Medina suggested when I saw her in November at the NCTE conference. At that time, I promised Meg to let people know about her availability to teach a variety of workshops from basic to advanced. In her presentation at NCTE, she said that too often people want to put her on diversity panels (we two happen to have been on a diversity panel for the ALAN workshop, along with Margarita Engle, Adam Silvera, and Hannah Moskowitz by the way), but they don’t think of her when putting together workshops and panels about plot, world-building, character development, etc. The success of the workshop that I adapted from her character interviews testifies to Meg’s ability to teach general writing topics, not just ones related to diversity. 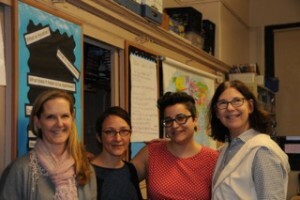 VCFA workshop facilitators, from left, Susan Korchak, Marianna Baer, Danielle Pignataro, and me. 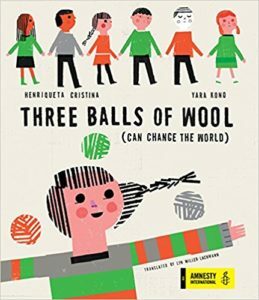 For my second workshop, on December 10, I returned with friends — three other VCFA graduates and writers of fiction for tweens and teens. 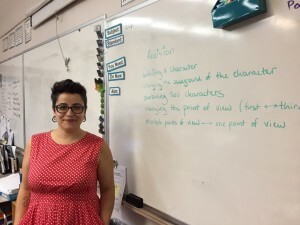 One of those was the eighth grade English and social studies teacher at New Voices, Danielle Pignataro (aka Ms. P), who runs the year-long after-school writing club. The other were Susan Korchak, my regular writing date partner, and Marianna Baer, whose YA novel Frost appeared in 2011 and who just sold another YA novel to Abrams that will be coming out in a little more than a year. Our focus in this workshop was the revision process, specifically the “big-picture” revisions. Danielle talks about her revision process. Danielle, Susan, Marianna, and I began by talking about the biggest changes we made in our story in the course of revising and why we made them. I started off because the kids really wanted to know how the published version of Rogue differed from the manuscript I gave my editor the year before. I revealed the big change, and since I don’t want to spoil the book for those who haven’t read it, I’ll just say it had to do with unkilling character(s). In comparison to most YA novels, mine don’t have a high body count. It’s easy to fall back on sensationalism and melodrama; creating emotional resonance and high stakes without death is the real challenge. In addition, many deaths are inadequately honored and/or mourned, so that they become devices to, say, get rid of parents or force the main character to become a better person. 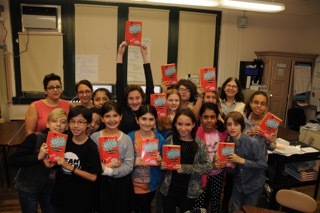 Students with their copies of Rogue. Photo by Susan Korchak. Danielle revealed her big change next. Originally, her protagonist was African American, but when she moved from a middle school in Red Hook to New Voices, she changed the race and background of the character. Two years away from her old teaching assignment, she felt that she had lost the connection; she was no longer immersed in the community and the lives of her former students. She felt she didn’t have the day-to-day knowledge to portray her protagonist effectively. Susan combined two characters. In her earlier drafts, her main character had two antagonists — a boy who teased her because she had a learning disability and was always falling behind or getting into trouble for not paying attention, and another boy, the best student in the class, who was her rival for a science-fair competition. Susan merged these characters into one, and changed him from a classic villain to a boy who had his own problems and his own reasons for trying to undermine her — specifically, the pressure his doctor and scientist parents put on him always to be the best. 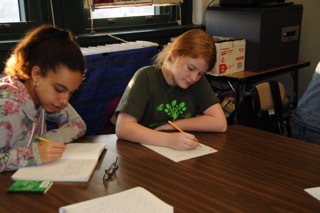 Students at New Voices School work on their revisions. Photo by Susan Korchak. While my change focused on plot and Danielle and Susan’s on the characters, Marianna’s involved point of view. At first, her protagonist narrated her novel, a mystery, in first person. Marianna found this too restrictive, since there were things the reader needed to know that her protagonist could not know, and the information presented in first person is, by definition, limited to what the narrator knows. Alternating first person, with multiple narrators, is one way of handling this, but Marianna chose to go with a third person narrator. Third person is especially useful for varying the narrative distance and presenting the perspectives of more than one character (though care has to be used to keep the focus on the main character(s) and not to go head-hopping within scenes). Students share their work with each other and with us. Photo by Susan Korchak. After our presentations and Q & A, we each sat at a table where four students worked on their drafts and shared what they’d written with their small group. We answered individual questions and offered suggestions for revision; the other students at the table commented as well. The students were supportive — Danielle has certainly instilled the spirit of the VCFA workshops into these students — and eager to share their work. Even ones who’d been reluctant to read in the past read their work this time. Individual suggestion we talked about included ending chapters on cliffhangers or other strong emotional moments, making sure there was a consistent point of view, and thinking about how magical abilities could be tied to a protagonist’s personality and desires. The students left the workshop eager to write more, and the four of us left eager to return. Thank you, Katie, Danielle, and the donors and supporters of the VCFA Young Writers Workshop for making these opportunities possible! I’m heading out for vacation, so this will be my final blog post of 2015. Thank you all for a wonderful year! I hope you all have a happy holiday season and a great start to 2016, and I look forward to staying in touch. Wow, what fabulous craft insights you shared! Those lucky students!!! You guys are paying it forward in major ways. Hats off to you. Thank you, Joan! During the spring, other NYC-based VCFA’ers will be presenting additional revision-related topics, and we’d love you to join us if you’re in the city. Happy holidays! Thank you, Linda! Our classmate Shelby Hogan’s lecture on this topic is one I keep coming back to and recommending to others. I also heard another great lecture on how and why to avoid killing off the parents last summer from Katie Bartlett.